Maximum depth of toe plate is (a+d). It should not extend below the bearing bars. The minimum recommended dimension for “a”, the projection of toe plate above the grating, is 4”. Toe plate to be welded with alternating 1/8” fillet welds, 1” long every 12”. 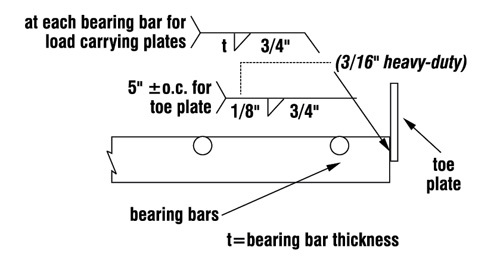 Load carrying toe plates to be welded at each bearing bar with a fillet weld the size of the bearing bar thickness (t), 3/4” long. Non-load carrying toe plates to be welded to bearing bars with 1/8” fillet weld (3/16” for heavy duty), 3/4” long every 5”. End band to be welded with 1/8” fillet welds (3/16” for Heavy-Duty), 3/4” long every 5”. 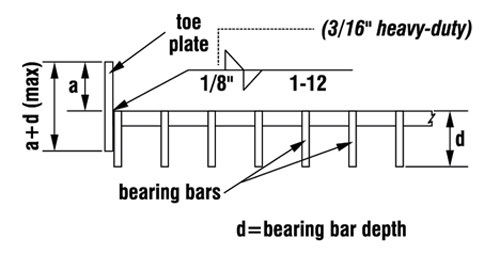 Load carrying end band to be welded with fillet weld the size of bearing bar thickness (t) and the length of bearing bar depth (d) at each bearing bar. This spec is for standard grating. Refer to NAAMM MBG 532 for Heavy-Duty spec.